The British government has been warned it may face legal action if it fails to consult Parliament and the public on the redeployment of drones outside declared warzones. Questions have been raised by Saeed Al Yousefi, a Yemeni man from a province that is a frequent target of US strikes, about the fate of at least ten armed Reaper drones currently based in Afghanistan. Ministers have so far declined to reveal where the weapons, which are piloted remotely from US bases in Nevada and Lincolnshire, will be used after December 2014, when UK operations in Afghanistan finish. The legal proceedings, notified to the government by legal charity Reprieve and law firm Deighton Pierce Glynn on Mr Al Yousefi’s behalf, ask the UK government to make clear its intentions for the Reapers, and confirm that Parliament will be consulted before any new deployment of the drones. In July, Defence Minister Mark Francois suggested the government would bypass Parliament, telling MPs: “The UK intends to retain the Reaper capability […] there is no intention for parliamentary approval to be sought prior to each deployment or re-deployment.” Foreign Secretary Philip Hammond has refused to rule out the use of UK drones against Yemen. 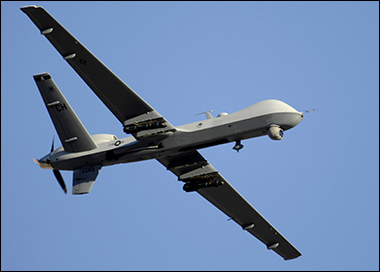 Predators and Reapers have been used by the CIA or Joint Special Operations Command (JSOC) to carry out secretive strikes in countries with which the US is not at war, such as Yemen and Pakistan. The strikes have killed hundreds of civilians, and take place with little or no oversight; President Barack Obama has refused to acknowledge formally that such strikes are taking place. This week, the UN’s human rights council launched an inquiry into the legality of the drone strikes, which UK officials were expected to attend.